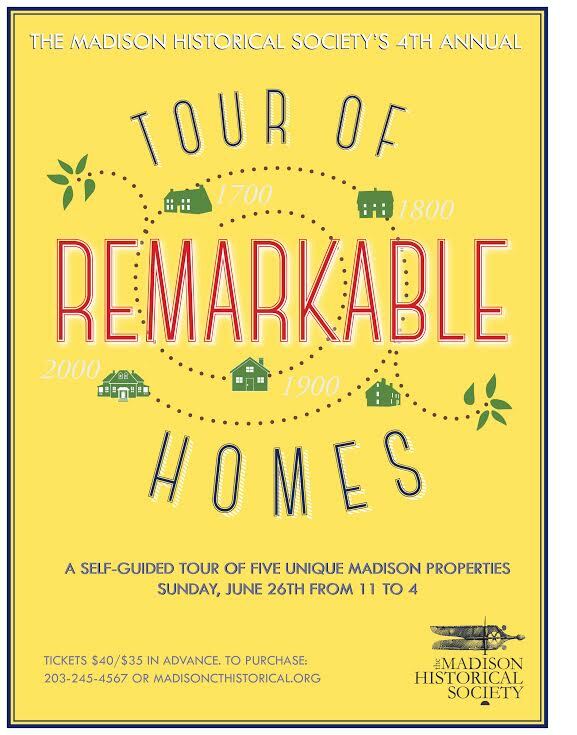 The Madison Historical Society (MHS) is pleased to announce this year’s fourth annual Tour of Remarkable Homes on Sunday, June 26, from 11am to 4pm. The Tour, featuring five unique Madison houses, is one of the largest fundraisers hosted by the Society, a nonprofit organization dedicated to keeping Madison’s history alive. The event draws hundreds of attendees, raising funds for the maintenance of the Society’s historic properties, the conservation of their collection, and educational programming. Ann Nyberg, the longest-serving full-time female news anchor in Connecticut television history and proud Madison native, is the event’s honorary chairperson. 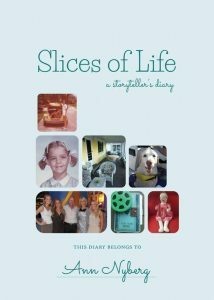 Ms. Nyberg will be greeting visitors and signing copies of her book, Slices of Life: A Storyteller’s Diary on the morning of the event. The five featured homes reflect Madison’s diverse architectural heritage and are remarkable for their age, location, size, interiors, and gardens. The one-day tour offers visitors the chance to explore these properties unhurriedly. Five local real estate agencies sponsor the tour; they provide docents who assist visitors and answer questions about the homes. With three large field stone fireplaces on the first floor, exposed beam ceilings, and wide plank floors, the circa 1690 Jonathan Murray House is one of the oldest homes in Madison. The two-story brick-red cape on Scotland Road underwent a top-to-bottom renovation in 2003 by Gulick & Spradlin, LLC. Many original elements remain in this antique home from the built-in corner cabinet to the impressive field stone hearth that greets visitors entering the house. The current owners, who split their time between Manhattan and Madison, envision their weekend home as a retreat for family and friends. To accommodate their many guests, they commissioned a Pennsylvania post-and-beam loft-style barn with sleeping quarters on the property. The barn is a place to kick back and relax with comfy sofas, a full-size ping-pong table, and a kitchen with barn wood cabinets and copper counter tops. The contemporary shingle-style home on Island Avenue was built in 2001 on part of the original Oakledge Estate. The estate originally encompassed the Princess Pignatelli home and all of the land down to the beach. Conceived by Rosalyn Cama, Interior Designer, the home reflects the evidence-based design principles that she incorporates into all her design projects. The house is positioned to take full advantage of the sun at all times of the day. The furnishings offer a richness and depth to the home with an eclectic mix of periods and styles. Peppered throughout are interesting works of art from artists with whom the designer has worked, as well as found objects she happened upon in her many travels. The circa 1843 Federal Greek Revival home known as the Jonathan Chittenden House is eponymous named for a Killingworth native and shipbuilder. The current owners, who have lived in the house since 1979, say their home is a constant work in progress. A labor of love, the home has a French provincial style with warm tones, comfortable furnishings, fruit wood armoires, and floral patterned fabrics. The playfulness in the owner’s design scheme is evidenced by the cheetah print wallpaper in the first-floor bathroom. The real surprise in this property are the gardens maintained and cultivated by the owners. Their land extends to the fifth hole of the golf course and has been the scene of many July Fourth parties and celebrations. Originally known as “Treetops,” the 1930s Middle Beach Road cottage was once the site of Camp Netab, a Girl Scouts retreat. Scenic views of Long Island Sound abound from this home elevated above the rocks and boulders incorporated into the design. The home experienced a massive renovation in the 1970s when a bedroom and detached studio/garage were added. The pagoda-style trim embellishing the front door, the wall of windows displaying blue and Chinese vases, and the Asian-inspired dining room enhance the home’s unique style. Rounding out the Tour is an 1860s farmhouse on Liberty Street. The current owners are only the second in the home’s long history. The stately Federal was rented for many years until it was purchased in 1985 by the current owners. Shortly thereafter, renovations began to convert the garage into a spacious family room with French doors opening onto a blue stone patio. A master bedroom with a walkout balcony extends the living space, and an updated kitchen includes all the modern amenities and conveniences. The Madison Historical Society is deeply grateful for the corporate sponsorship of the following realty agencies: Berkshire Hathaway, Coldwell Banker, Page Taft/ Christie’s, William Pitt Sotheby’s, and William Raveis. Without their support and guidance the tour would not be possible. In addition to the five featured homes on the tour,, visitors are invited to stop at the MHS’s Allis-Bushnell House for light refreshments and a tour of the property. Complimentary tea sandwiches, sweets, and homemade lemonade will be served. Owned and protected by the MHS for nearly 100 years, the house museum’s lower level has recently been renovated and made accessible to all town residents. It is located at 853 Boston Post Road and will be open during the tour. Tour tickets can be purchased at Lee’s Academy at 14 Meetinghouse Lane, where the Society has its administrative offices and exhibit space. Tickets are $40 on the day or $35 if purchased in advance via the Society’s website www.madisoncthistorical.org. Tickets are also available at Walker Loden locations in Madison and New Haven.